August was a whirlwind to say the least! I started a new job which is way more creative than my previous position. This will hopefully set a precedent for more productive afternoons since I am off at noon everyday! Hopefully my schedule stays that way. Prints have continued to sell at Artistic Portland, which is super exciting! My “Jurassic” print seems to be quite popular, along with my “Violet Trio” trees print. I am still working on getting a leather jewelry collection going for the gallery before the holidays. It’s interesting and exciting to see how sales have ramped up for the gallery since their move from north Portland to being in downtown Portland. The gallery brings more art and handmade goods to SW Taylor, and the atmosphere is inviting. Does anyone else have issues being in a creative rut? I seem to be getting into them more and more. I have found that switching up the craft helps, so if I am trying to paint and nothing is working I resort to jewelry, which has been inspiring in the pattern making realm in regards to color harmony. However, I then abandon the painting for a while before returning to it with fresh eyes. I am hoping my new schedule helps me focus. 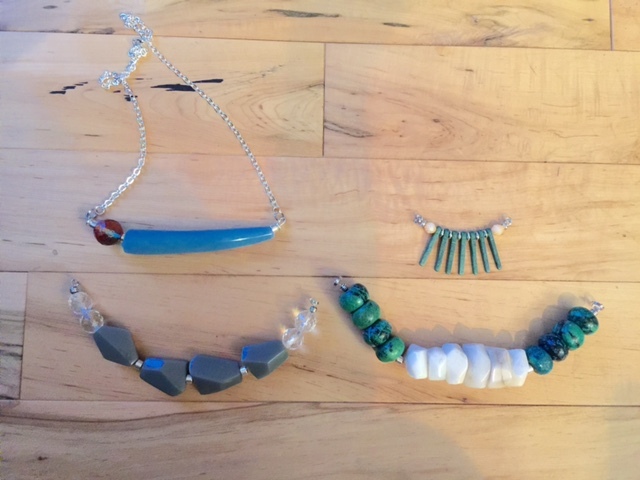 In the meantime, here are some necklace pieces I have put together when I was attempting pattern designs for fabric! Fresh necklace pieces by Marjorie Henderson. 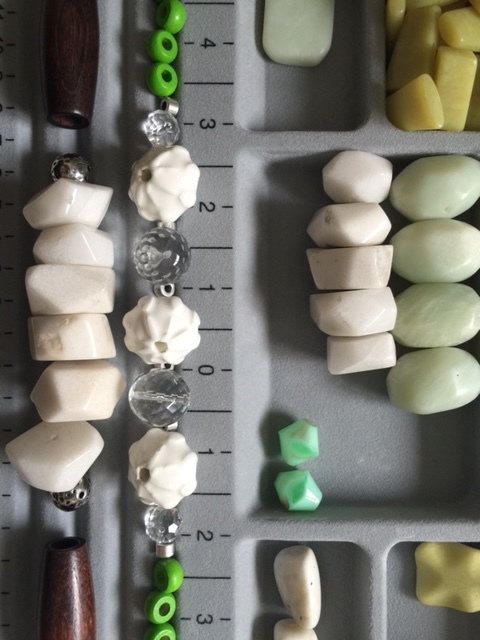 I have been working a bit with vintage lucite beads, which are present in the bottom left piece, as well as resin, present in the top left piece with a glass bead. I love mixing different materials that I don’t always find in your typical jewelry, such as glass and stone. I love them all, but I have really enjoyed the quality and weight of vintage lucite, along with the funky shapes that I have found. I’ll be working on creating a cohesive collection of textile prints inspired by some of these shapes that I have found, more to come on the textile front!